One set of cards, so many different skills to work on! 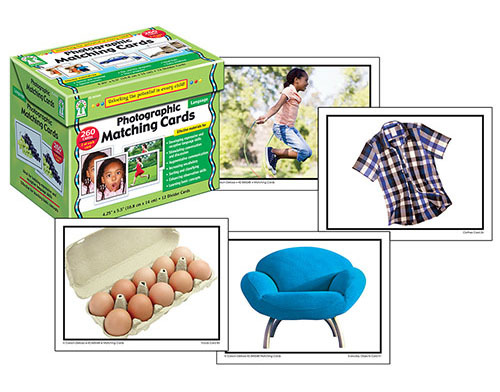 Photographic Matching Cards contains 260 cards – 130 unique cards with an identical match – that cover 12 basic categories: Actions, Clothes, Colors, Emotions, Everyday Objects, Farm Animals, Foods, Pets, Shapes, Toys, Transportation, and Wild Animals. This week only, take 15% off* your set of Photographic Matching Cards by using our promo code MATCH15 at check-out! These cards are ideal for developing expressive and receptive language skills, as well as sorting and classifying skills. Students who are ready can use the cards to stimulate discussion and conversation. The cards portray children in a variety of settings, full of real life and childhood enchantment. Each of the 260 cards measures 5½” x 8½”. Don’t forget to apply or mention promo code MATCH15 to save 15%* when you purchase your set of Photographic Matching Cards this week online or over the phone with us! *Offer is valid until 11:59pm EST on March 3rd, 2015. Not compatible with any other offers. Be sure there are no spaces or dashes in your code at check out! Written by: Different Roads to Learning on February 24, 2015. This entry was posted in ABA, Academics, Applied Behavior Analysis, autism, Daily Living Skills, Development, Pick of the Week, Products, Sale and tagged Applied Behavior Analysis, autism, autism education, autistic spectrum disorder, developmental delays, expressive language skills, language development, learning, Matching & Sorting, Photographic Matching Cards, social skills, sorting and classifying skills, special education, teaching tools, visual supports by Different Roads to Learning. Bookmark the permalink.